You finally did it. You realized your dream and leaped the “brave” leap. Your fellowship sneaked in the Qur’an burning while we weren’t looking and word spread to the Muslim world. 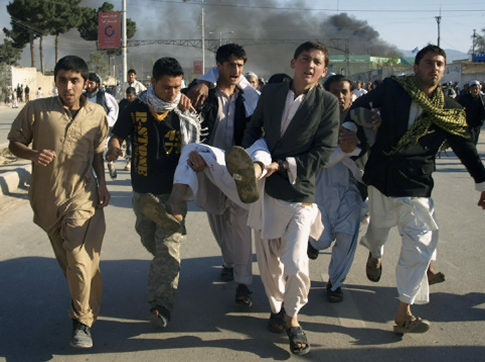 Riots erupted in Afghanistan and several now lay dead. Dozens are injured. But please, don’t forget to make that next, crucially “brave” step. Do it for us and for you. I dare you. The world is watching. I’m issuing this dare after crawling around your psyche and viewing the universe through your eyes: burning the Qur’an was so reasonable, so responsible, so conscientious. You were making a point: Islam is inevitably violent. Muslims reacted with violence, so case closed. Right? Never mind that most Afghan demonstrations were peaceful and insurgents may have inflamed the protests. You’re in the clear, innocent, justified, blameless, and vindicated. Any argument against your hole-riddled logic filters through a foggy, near-sighted worldview and circular reasoning’s feed-back loop: Disagreement is persecution; no one appreciates your self-sacrifice; accusers wouldn’t accuse if they weren’t blind, so their emotional accusations prove they’re emotional and blind and accusatory. They wouldn’t blindly, emotionally accuse if they understood your altruism – and the objections of world-wide Christian leaders prove the devil grips the world-wide Church. Angels lift you and your tiny fellowship above the demon abyss and only you hear the heavenly choir — not to mention the one solid plank on your rotten platform: That mob in Afghanistan had no excuse to kill all those people. None. Its members are responsible for their actions – just as you are for yours. I won’t bother feeding the feed-back loop. I won’t point out how you mocked your own anti-abortion stand when you showed no care for the potential loss of innocent life, nor will I insinuate that you jeer your own patriotism when you dismiss the safety of our troops. I won’t question your own self-perceived bravery and point out that you’ve hampered the witness of genuinely courageous missionaries in the Middle East, who jeopardize their own safety while they share the Gospel. I won’t say that your “bravery” pales when compared with Christian converts in Muslim countries. They risk their lives while your “church” burns the Qur’an in sunny Florida. You had something to prove – and you “proved” it. But it’s still not finished. There’s one more act of “bravery,” and I dare you again and double-dare you to do it: Visit each mourning family. Look into the eyes of the spouse who suddenly sleeps alone and the children crying for their newly-dead parent. Explain your “cause” to them. Tell them why you made that point. Explain why you, supposedly a preacher for Jesus Christ, the Prince of Peace, valued your cause more than their lives. Describe why you and your church built an altar on which their loved-ones would be sacrificed for your “point.” Clue them in on what motivates those who stomp on life in the name of altruism. Tell them why you didn’t fly to Afghanistan – or any other Muslim nation – and burn the Qur’an there. Tell them why innocent UN workers had to die in your place. Perhaps they’ll remind you that the truly courageous offer their lives for the sake of others, not vice versa. And don’t worry. We’ll make sure there’s a line-up of faucets on your journey. We’ll even turn on the water so you can try to wash all that blood from your hands. Add to those thoughts, the point that in their belief system, this act is the same as burning their deity, as the Qur’an has equal religious regard as Allah. In my experience, most Christians don’t realize that.